The district of Ropaži, found in the Vidzeme area of Latvia, stretches from the Mazā Jugla River near Rīga to the Gauja River near Inčukalns. The area has been inhabited since as early as 4500 B.C., and the ancestors of the Semigallians lived there starting from the 1st century A.D. The region has a long and colorful history (the first mention of it in historical documents was in 1205), and throughout the millennia, many songs and stories about the region have been sung and told. 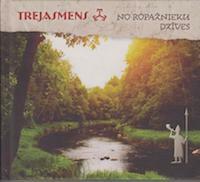 Recognizing the wealth of folklore material to be found in this area, the Latvian folklore group Trejasmens (along with many guests) released an album entitled No Ropažnieku dzīves, a two CD set – one CD is songs, the second contains stories, all from the Ropaži area. 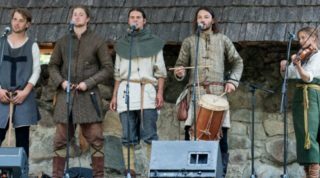 Trejasmens, who have been performing since 2001, are made up of Andrejs Planders, Viesturs Āboltiņš, Pēteris Lukašēvičs, Jānis Siliņš, Juris Bariss, Uģis Urtāns, Līga Slišāne, Baiba Ērgle, and Dārta Apsīte. On the album they are joined by a multitude of musicians and storytellers, including members of the Zaķumuiža folklore group Oglīte, the Ropažu men’s ensemble Karma, members of the folklore groups Vilkači and Skandinieki, among many others. All have joined together to present an exhaustive musical and verbal presentation of the Ropaži district. 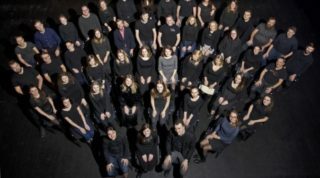 The group performs traditional arrangements of these songs, and the songs, usually fairly brief, are punctuated with brief instrumental bursts, making for an energetic tour through the musical history of Ropaži. There is a broad variety of songs, from songs about going to war – “Lai aug puri, lai aug meži”, to midsummer songs like “Ņem, Jānīti, sirmu zirgu, ligo, ligo”, to supernatural topics like werewolves and witches in “Vilkač Janka”, where one learns that Jānītis gave himself away as a werewolf as he always went for the bowl of meat first. Many of the songs are also quite humorous, such as the song “Vīzdegune”, where the narrator brashly tells a conceited girl that treats him shabbily that he will find one that was raised better. Also, noting that the area also had many inhabitants from the Liv culture, there is the song “KORB”, dedicated to the Vidzeme Liv people. The second CD of stories also contains a variety of tales, both historical and mythological. Some are amusing, such as ‘Kā desas līkums noderēja revolvera vietā’ – a story of a traveler who, when threatened by robbers, manages to convince the bandits that a sausage is a revolver. The story does not end there, as the robbers stop the traveler a second time, and, thinking that he just has a sausage again, fatally discover that he really has a revolver this time. There are more tales of werewolves, such as ‘Saimniece Vilkate’, and, as a note to the story indicates, the inhabitants truly believed that they existed, as a local minister Godelmans even wrote in 1587 that the werewolves had been living in the area for a long time. As with many other releases from the Lauska record label, the excellent performances are supplemented by excellent packaging. The two CDs come in a richly illustrated hardback book, with more than 70 pages of history, cultural notes, song lyrics, drawings and pictures. There is a brief, but fascinating history of the Liv people in the area, though they were almost fully assimilated in the mid-19th century, some families still remained and the Liv language was still spoken even in the 20th century. However, besides a brief introduction and some song explanations in English, the rest of the text is only in Latvian – which is understandable, given the large volume of information contained in the booklet. The Ropaži region has a wealth of songs, stories, and folklore, and Trejasmens’ album No Ropažnieku dzīves brings much of this wealth to life through songs and stories. Through vivid performances and storytelling, this two CD set is a comprehensive and thorough presentation of the Ropaži region’s history and culture. Supplemented by some of the most comprehensive liner notes in any recent release, the album is at once entertaining and a valuable historical record. For further information please visit the Lauska record label website.